Ram Navami is one of the most celebrated festivals that honour the victory of Dharma over Adharma. This year, 2019, the important Hindu festival will be celebrated on the 14th of April according to the Georgian calendar. According to the Hindu calendar, it falls in the ‘ Shukla Paksha’ on the ninth day of the month of Chaitra and is also celebrated as the last day of the Vasanta Navratri. While celebrating the birth of the seventh incarnation of Lord Vishnu, Rama, who was born to King Dasharatha and Queen Kaushalaya, this day is celebrated both among the North Indiana and South Indians, with great fervour and enthusiasm. Special food is prepared to make the celebration more exciting. Panning from south India to North India various types of traditional dishes are prepared. Rama Navami 2019 Date: Know Everything About Vrat Katha, the Story of Lord Ram. A traditional healthy south Indian drink especially prepared to celebrate Sri Rama Navami, Panakam is an amazing energy drink for hot summer days. This is a special prasad made out of wheat flour and jaggery and is prepared usually in North India. Roat tastes sweet and can be prepared easily. Special prasad thali can be prepared easily at home with sweets such as aloo chashni and makhana kheer. You can consume this even if you are fasting. Kosambari is prepared as a traditional Naivedyam on the occasion of Sri Rama Navami by south Indians. You can easily make Kosambari at home with simple ingredients such as Moong Dal and different veggies. Who doesn't like rabdi? And with dry fruits in it? The traditional sweet dish becomes even more special. 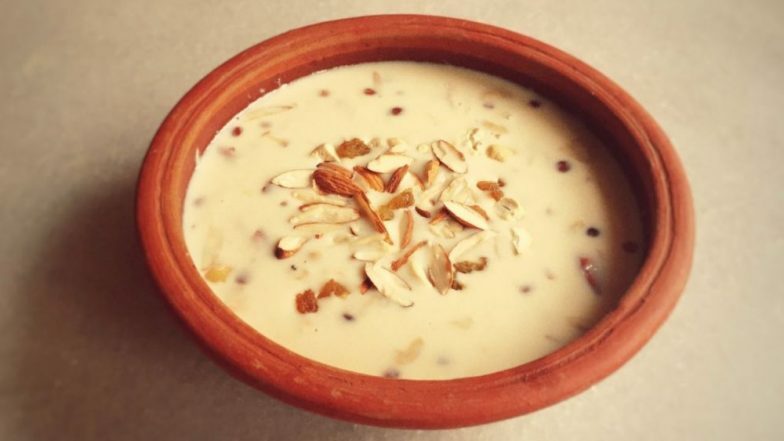 Dry fruit rabdi can easily be made at home with simple dry fruits and milk. It can also be consumed in fast. We wish you a very happy and prosperous Ram Navami and may these sweet dishes make your life even sweeter while you enjoy them with your family.